Pomerol wines are characteristically subtle, generous and elegant, displaying unique features bestowed on them by their respective owners. 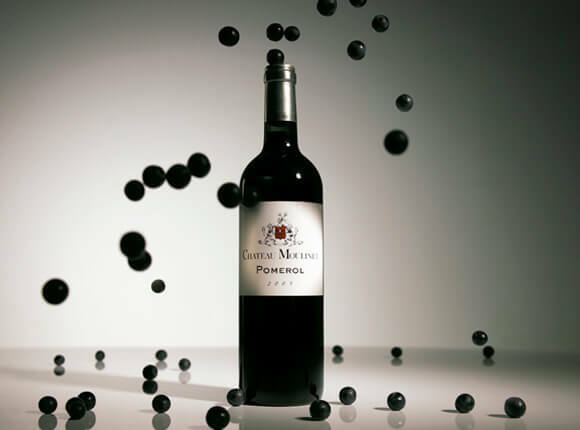 Château Moulinet displays distinctive aromatic complexity, is highly attractive on the palate and has a stylish finish. Beautiful dark ruby red robe. The wine expresses red fruit, spices, toasted wood, liquorice and cocoa. It is powerful, yet round and elegant. Ripe red fruit bouquet with hints of pepper and liquorice. Good quality substance on the palate. Ripe red fruit on the bouquet moving towards alcohol-preserved fruit, complex. Big and supple on the palate, complex combination of fruit aromas and wood, toasted on the finish. Black fruit on the bouquet (very ripe blackcurrant) and smoky. Concentrated, dense, generous palate. Very long finish with tight yet subtle tannins. Intense garnet robe with violet tints. Lush, medium density palate with a woody finish that sets the wine off nicely. Garnet robe with crimson tints. Fresh fruit on the bouquet with slightly spicy, smoked hints. Clean and subtle on the palate with good density. Slightly firm tannins on the finish. Strong bouquet of fresh fruit, some exotic (white peach, mango). No-nonsense palate, intense fruity aromas and persistent, tight tannins on the finish. Deep robe with violet tints. Black fruit on the nose with floral hints – white fruit blossom. Delicate and big on the palate with good density and a persistent, elegant finish. Complex bouquet of black fruit with fresh menthol hints. Straight and focused on the palate, dense and powerful with a delicate, yet racy finish.